ObsidiPlates Mod adds more fun to the game by enabling players to have Pressure Plates, which is activated by either Players or NPCs, depending on what they’re made of. All plates are a type of switch that can be placed onto the surface of a block. If connected, by wire, to an object (or placed adjacent to a block that can be powered), it will provide power to that object or block when stepped on by a player (or NPC, if a Mossy Pressure Plate) and will stop when stepped off. 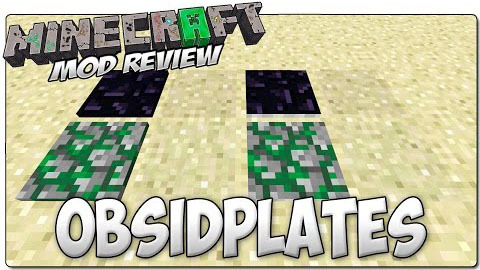 As opposed to wooden and stone pressure plates, Obsidian Pressure Plates will not respond to items or NPCs and Mossy Cobblestone Plates will not respond to items or players. Silent versions of these plates make no sound. Shrouded versions of these plates are see-through. Silent and Shrouded plates can only be be crafted as silent first then adding shrouded last.